The Blog Formerly Known As The Blue Cottage: Sharp Objects & Bubble Gum Pink Rubber! 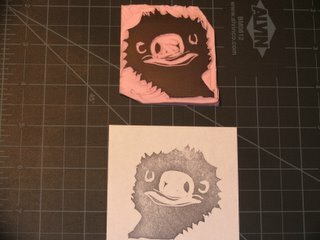 This is my first EVER attempt at carving a rubber stamp. I used Speedball Speedy Stamp rubber and Speedball Carving tools. It's an emu...and she's looking at you. Cute eh? In a weird sort of way? I love this emu so much, that I want to emulate him! Kimber and I named her.."Essa Emu"..Essa being short for Esmeralda. Very very cute! Emu is the nic name I call my mom so I found this one especially cute. megananne...wow, you really searched back in the archives :) So glad you liked Emu..he was fun to carve...being my first! I am entering you in my May giveaway for a free journal! Thanks for stopping by!